Invelos Forums: possible to extract the .jpeg headshots out of a .dpb file? possible to extract the .jpeg headshots out of a .dpb file? i see the folder for "credits photo"s in the document/dvd profiler folder tree. or import into Tom Gaines Cinematic Collection Viewer v3.3.0??? It is very easy for a plugin to do. I have unreleased code to do it. I offered it a while ago. Nobody seemed interested at that time. Out of curiosity, what are you trying to do? You realize that the credits folder has an organization by profile ID, so you would need to duplicate images or manage shortcuts to show an actor in multiple movies. On the other hand, when they are encoded within the database, they can be used by all profiles. I totally see the usefulness of the database format to be shared by all profiles. I am a visual person sometimes, so i would like to see all of the headshots in one batch to sort thru. In the usual setup, we can see for each profile the left side list of cast which is there (showing the little avatar character) ,or not there. I am not sure how to look at ALL the cast from ALL the profiles at one time, to start searching online for headshots to complete the ones missing. "It is very easy for a plugin to do." ...could you explain or where do i look for such a plugin? If I keep a folder complete separate from the workings of the program, i could stroll thru and refer back to the persons, in finding better headshots where needed. Go back and read the following two sentences I wrote. I was offering to write that plugin, but now I am not sure you need it. Just edit ANY profile, and go to the Cast / Crew pages. 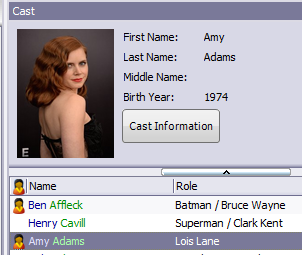 You will see on the left hand side, ALL the cast or crew that are in your database. From there, you can easily add to any profile, update the picture. Double click and the program will do an automatic online web search. Even if somebody writes a plugin, how could it be easier than that? For another thing, Mr. DJ Doena, wrote me an excellent PM to remind me of a feature that I had forgotten about, and I gave you wrong information. His message was so excellent, I am going to share the PM. I know that he will not mind. He was being polite to not embarrass me in public for such a mistake. You realize that the credits folder has an organization by profile ID, so you would need to duplicate images or manage shortcuts to show an actor in multiple movies. Notice the file names on his pictures. Encoded in the file name are last name, first name, middle name and birth year. It is the official DVDP Profiler way of identifying head shots on a disk file. Does anybody remember where those rules are described? Maybe in the Wiki? Notice the file names on his pictures. Encoded in the file name are first name, middle name, last name and birth year. 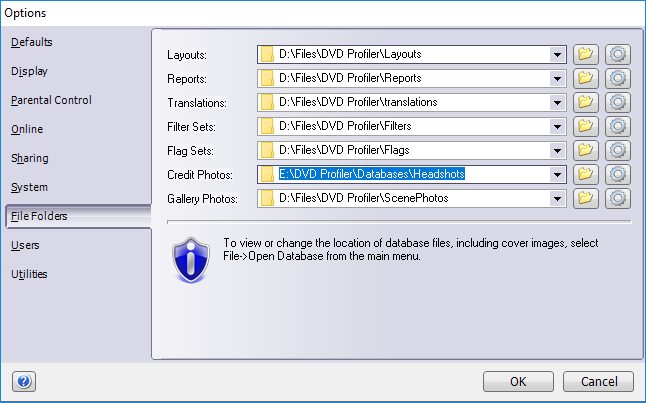 It is the official DVDP Profiler way of identifying head shots on a disk file. Does anybody remember where those rules are described? Maybe in the Wiki? The wiki used to be here: http://www.dougweb.org/dvdpro/kb/index.php. Unfortunately it appears to be gone. Note: The file name doesn't need to have a birth year. If DVD Profiler doesn't find a file with birth year, it will use the one without a birth year. Example: Kevin Smith (1970): Smith_Kevin__1970.jpg doesn't exist, but Smith_Kevin_.jpg does. DVD Profiler will use Smith_Kevin_.jpg instead. i have nearly 500, but i know more that that is actually in the profiles combined. Not sure of the use of the credits folder, if it is as well in dpb files are being created. Would be nice to have the same reflected as jpeg in the credits folder as is in my dpb of profile photos. 2. OH! so each profile contains the database fr all the cast/crew available in my setup??? coolness. That's OK. Please take full advantage of what is already there. Use the help file. Just click around and try things. There is so much in DVD Profiler that most people (including myself) forget really cool stuff. Most of the questions asked in these forums can be answered with a little bit of research and actually using the program (not complaining about you - this happens all the time). For example, this comment "2. OH! so each profile contains the database fr all the cast/crew available in my setup??? coolness." shows that you haven't fully explored editing Cast and Crew within the program yet. I suggest that you do. By the way, your questions had some really good results. I was reminded about things I forgot. We discovered that the Wiki is gone, and DJ Doena gave a good summary of some hard to find information. So keep asking those good questions!!! Would be nice to have the same reflected as jpeg in the credits folder as is in my dpb of profile photos. Again, this is easy to accomplish for a plugin developer. But is "nice to have" a good enough reason to expect somebody to do it? For myself personally, I usually respond most quickly to those guys who are helping to build the database, and keeping the data up to date and accurate. On the other hand, I already offered. So far, the only person to respond has been you. So, it is on the list. Thanks so much Mediadogg and ALL for you help! i can see a little more clearly, and will investigate profiler some more for tools and tips. useful to find as those difficult headshots within a movie. For example Gandhi, there was many to find to add. There are more websites as well that are great i am finding day by day. Dj Doena.. thank you so much for the cast/crew edit2 tool. and dealing with tv episodes. if i try and keep it open for more than 3 searches..
regardless it is a great item!